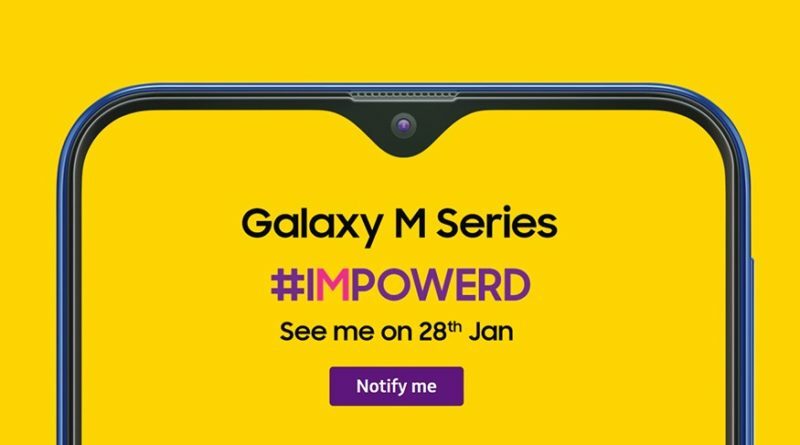 Samsung Galaxy M series , the all new upcoming series by Samsung for India is going to launch in India on 28 January. The all new M series is India Exclusive and only made for Indian Market. The Company is continously posting teaser on its social page with hashtag #impowered which basically translates ” I AM POWERED “. According to reports , the M series smartphones will come with Powerful Processor , New Design and big battery. The Samsung Galaxy M series will include three devices M10 , M20 and M30 smartphones. Samsung Galaxy M10 and M20 will be the Mid-Budget Segment smartphones and first devices in M series. Also Samsung Galaxy M10 has been listed on company’s Website with SM-M105F/DS model number. The Samsung Galaxy M series devices will be sold through Amazon and Samsung Online Store only. Both the devices are expected to come with Infinity U display which will also feature Waterdrop Notch. The Galaxy M10 will be powered by Exynos 7870 whereas Galaxy M20 will be powered by Exynos 7885. The Samsung Galaxy M10 is expected to come with a 6.5-inch display with water drop notch display. This new display from Samsung is named as the Infinity-U and Infinity-V display. The smartphone is expected to feature dual camera setup on the rear with a wide angle lens. Coming to the performance, the Galaxy M10 will be powered by a mid-range Exynos 7870 processor. The device may come with only one variant with 3GB RAM and 32GB Internal storage which can further expanded via Micro-SD Card. m10 will come with 3400 mAh capacity. which will also support fast charging. The smartphone is also expected to come with type C post instead of Micro Usb port. It will run on Android 8.1 oreo out of the box.The samsung galaxy M series will replace the old and outdated On series and J series by Samsung.